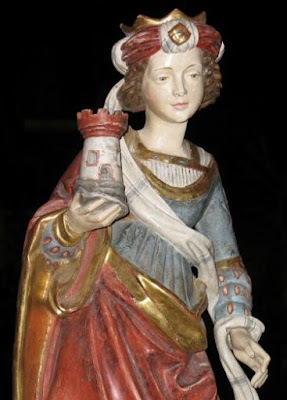 Continuing on with our preparations for Advent, let us now turn to an Advent custom which is particularly rooted within the Germanic tradition -- where so many Advent and Christmas traditions seem to originate -- Barbarazweige or St. Barbara's branches. While Germanic in its origins, it would be easily adoptable in various other locales. The feast of St. Barbara is traditionally celebrated on December 4th and still is universally within the calendar of the usus antiquior. It is likewise still kept on this day within the modern liturgical calendar of the German speaking countries of Europe, where there is yet a great devotion to her. 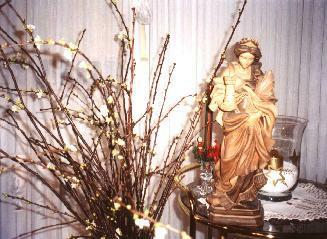 The custom thereby arose that, each year on her feast, people would go out and cut some branches from some flowering tree such as a cherry, hazel, forthysia or apple, place them in a vase, and water them. This done, people would wait in expectation for them to blossom on or near Christmas Day -- which accordingly ties in very nicely to Advent and the expectation of the birth of Christ. One can readily see how customs such as these not only to help enrich a liturgical season itself, they also help to enrich one's appreciation of the Church Triumphant.